This meticulously renovated, 2 bedroom garden level apartment in a historic brownstone located on one of the most beautiful streets in Prospect Heights blends historical details with modern updates. The building is mid-block, which provides for a quiet home. It is located just half a block away from stores and restaurants on Vanderbilt and Flatbush Avenues, half a block from the B/Q stop (express) and 2 blocks from the 2/3 stop. 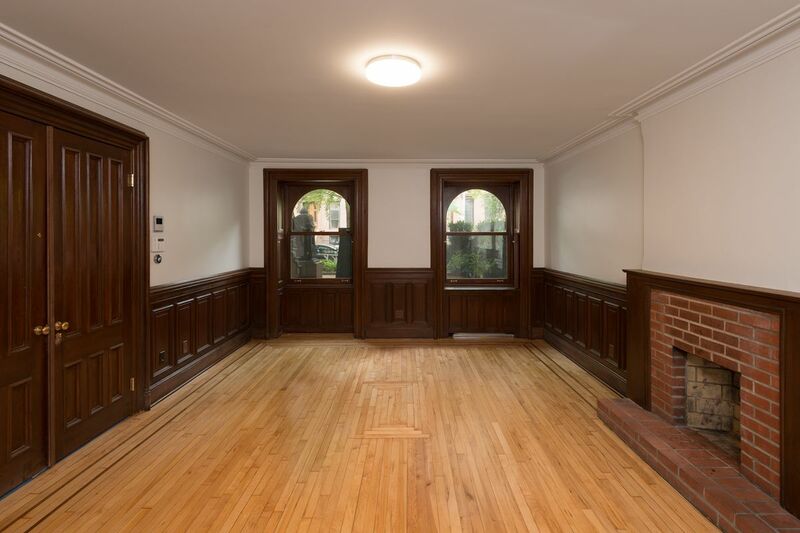 Prospect Park, Farmer’s Market, Brooklyn Public Library and the Botanic Garden are nearby.The bright apartment has just been renovated (2017): all plumbing, electrical wires, and windows are new, as well as the kitchen, bathroom, and appliances. It has a private patio, a W/D in the apartment and oak floors throughout. The huge living room boasts original built-in shutters, a (non-working) fireplace, and a big closet. It is large enough to accommodate a dining area with seating for eight. The kitchen has Caesar stone countertops, Bosch stainless steel appliances, a Miele dishwasher and Italian custom built cabinetry. Both bedrooms are spacious with large closets. The modern spa-like bathroom has glass tiles, a tub with rain shower and an LG washer and dryer. The south-facing private patio is situated just outside the master suite. Heating and AC of each room can be individually controlled by a Nest thermostat or from the Nest app on your phone. (Heating and AC is included in the electrical bill.) The apartment is wired for FIOS, has a video door monitor and an alarm system. No pets, please. Available now. Price includes water, excludes electrical bills.